I’m wild about Northwest salmon. And you? 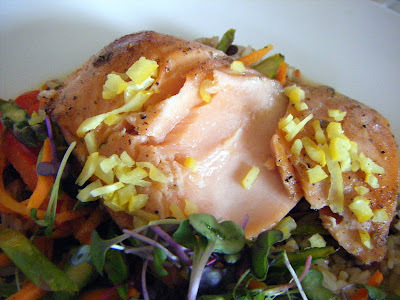 I like my Northwest salmon raw and cooked, kippered and cured, dressed to thrill or simply grilled. I adore its roe, its bony “collar” and its edible skin when properly crisped. I’ll never say no to my favored finfish tucked into fresh pasta or layered over a fresh bagel. And with summer’s salmon season upon us, I thought I’d swim through town for a tasting tour (as seen in today’s Ticket section) and offer finds along the way. But I wasn’t always a Northwest salmon-lover. 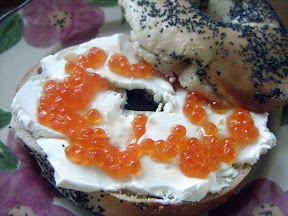 As you likely know by now, I grew up on the Atlantic seaboard, among people who ate their salmon one of two ways, each requiring a fresh bagel and a thick schmear. 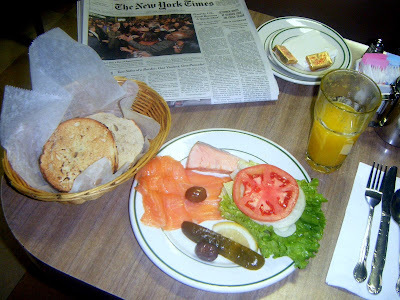 A schmaltzy piece of kippered salmon with some nice “belly” lox: my idea of breakfast. But one day I kissed those folks goodbye and moved west, briefly to California, and later north to Alaska, where I learned there are two ways to fillet a salmon: the right way, and the wrong way. 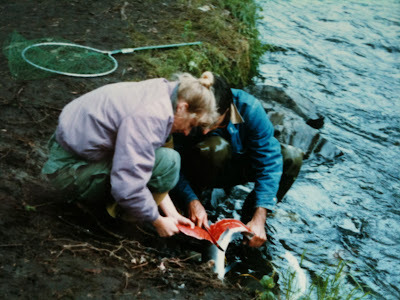 The latter is illustrated below by yours truly and friend, poised on the bank of the Kenai River circa 1986. A fishing expedition in the “Land of the Midnight Sun.” It’s 4 a.m. on the Kenai after a long night waiting tables in Anchorage, and what can I tell you? We forgot the damn cutting board and the salmon were jumping faster than we could catch them. I had my first taste of Japanese food in San Francisco when I was 20, but it wasn’t until I moved to Seattle that I learned to eat salmon the way they do in Japan: in as many ways as possible, including in its nascent form, a practice I soon adopted as my own. Ikura with daikon, enjoyed late last month at Maneki, and ikura from Loki Fish Co., available at local farmers markets to enjoy at home on a bagel. Speaking of bagels, which I so often do, say hello to AJ Ghambari, whose father, Ali, founded Cherry Street Coffee House — now with five downtown Seattle locations to serve you. Including the one across from Harbor Steps where I had a chance to kick back with AJ. He didn’t have to work too hard to convince me that his cafes are a great place to stop for house-cured lox on a Seattle Bagel Bakery bagel. Many firsts: AJ, hanging out in front of the Cherry Street Coffee House near First and Seneca on “First Thursday” where I caught up with him after having a late lunch (incognito) up the street at his store near First and Lenora. 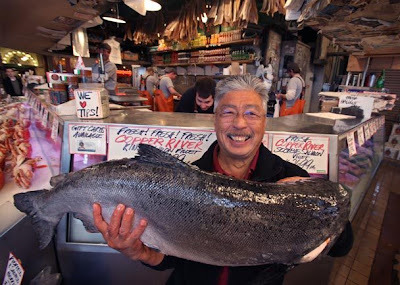 John Yokoyama, owner of Pike Place Fish, showing off a prized specimen. There are Pike Place Market denizens who would turn you on to the classic pit-roasted salmon with shiitake relish at Etta’s (ooh, that cornbread pudding! ), and who am I to disagree? But when I’m in the Market for salmon, you’re likely to find me at one of two places. If it’s lunchtime, and especially if it’s cold and/or wet out, I duck into Oriental Mart in the Corner Market Building and have my pal “Auntie Lei” set me up at her counter with some of her sinigang salmon soup, a Northwest/Filipino specialty made with the bony salmon collars Auntie Lei buys from the local vendors. Comfort me with salmon bones. Plus some mustard greens, tomato, a hit of dried tamarind. Lei swears this was made with Copper River salmon, and it was so rich, I wouldn’t doubt it. Over the years I’ve eaten some of the best king salmon I’ve ever tasted at the Steelhead Diner, where chef de cuisine Anthony Polizzi presides in the kitchen now that his boss and mentor, Kevin Davis, is upping the seafood ante midtown at Blueacre Seafood. 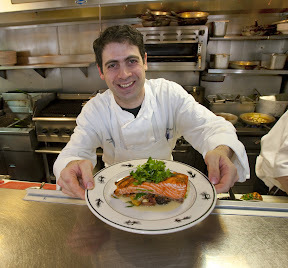 Steelhead chef Anthony Polizzi, photographed by my colleague Mike Siegel, seen last week with Copper River king salmon in hand, seasonally “sauced” with baby artichokes and morels. And one of too few Yukon River kings, prepared last year by Kevin Davis, starring sweet summer corn — photographed by me before I stuck a fork in it. While I’m on the subject of the Yukon River, here’s some news: Elliott’s Oyster House, where wild Northwest salmon is a mainstay on the menu, is lending a hand to our friends on the Yukon this month and you can help. 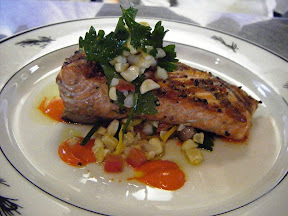 Go down to Elliott’s, do yourself a big favor and have some oysters, and then order the Yukon keta salmon. Between now and month’s end, 25 percent of the cost of keta entrees will go directly to the Boys & Girls Club of Emmonak, home to the region’s own Kwik’pak Fisheries, helping Native Alaskan villagers who can use a helping hand from their salmon-loving Seattle chums. atop the Space Needle. And though it’s been a while, I can still recall how pleased I was to show off our city and our salmon to those charming villagers, whose lives and livelihood depend on their salmon catch. View from the top: wild Northwest king salmon, prepared to perfection at SkyCity at the Space Needle. Meanwhile, down at Tulio in the Hotel Vintage Park, it’s all about Italian food. And chef Walter Pisano insists that if there’s one dish he can never remove from his menu, it’s the smoked salmon ravioli with lemon cream sauce — a menu staple since 1992. One look at these beauties, prepared for me last week, and I don’t suppose I have to tell you why. At Tulio, named for chef Walter Pisano’s dad, the smoked salmon ravs are ravishing. Sometimes, though, all you want is a nice glass of wine (or four) and a salmon nosh (or two), which is exactly what I sampled on a recent evening at Purple Cafe & Wine Bar. Though Purple has four locations (and a new wine-centric sibling, Lot No. 3, open last week in Bellevue), the “Tasting Bar” menu at the Purple cafes in Seattle and Bellevue always lists wild Northwest salmon snacks, like the ones seen below. Salmon mousse-stuffed Peppadew peppers (left) and Gerard & Dominique smoked salmon blini with egg salad — and a salmon-colored flight of roses, downtown at Purple Cafe & Wine Bar. Closer to home, I chowed down on Bristol Bay sockeye, a terrific salmon burger offered at lunch at Hill’s — a bustling Richmond Beach bistro that keeps changing its apostrophe. When I introduced the place to my readers several years ago it was called Hills’ — which drove me (and my copy editors) crazy, but now the apostrophe’s back where it belongs and so am I: seated in front of this sandwich. The grilled sockeye salmon burger at Hill’s — a favorite among the ladies (and gents) who lunch in Richmond Beach. So, OK, it’s your turn. 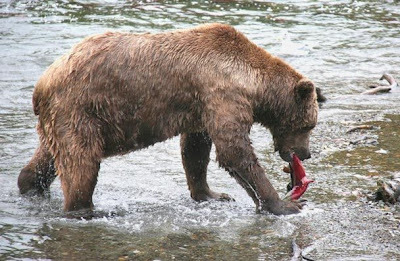 Tell me where you go around here when you’ve got a taste for Northwest salmon.